I love homemade bias tape, bindings, and piping. I think there’s something fun about choosing which fabrics you’d like to use to give a pop to your project. 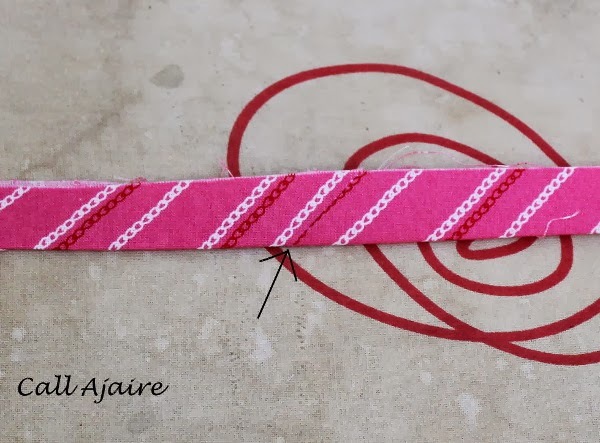 The bias tape you buy at the store is generally boring solids, the fabric feels rough to the touch, and it’s way more expensive than I’d like it to be. But I’ll also be the first to say that making bias tape is tedious at best. Here I’ll show you my method of making the process much more streamlined. You know, so you can move on to the fun part of actually USING it, hehe. I find I always spend time looking through my pinterest boards to remember which ends to sew together so I don’t end up wasting my fabric. I’m usually looking for a specific amount of bias tape and with that method it’s a math mystery to me exactly how much will be produced. 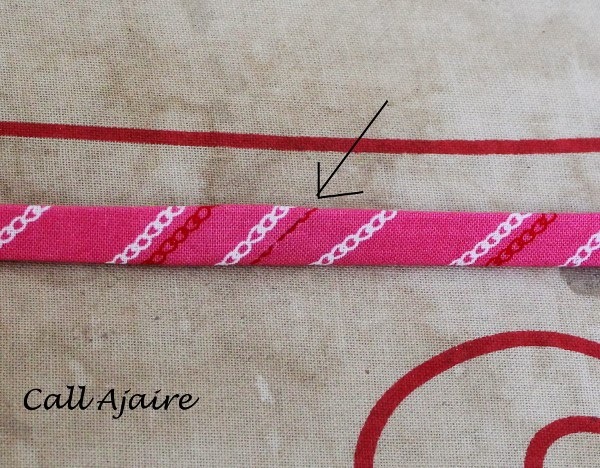 If you want to make only a small amount of bias tape the tube would have to be pretty small which can be tricky. I’m not the most accurate with my scissors and tend to cut the lines a bit wavier than I’d like which makes it harder to create binding from the bias tape later. I like to make bias tape out of scraps of fabric which makes using the tube method pretty much impossible. My method addresses all of these issues. 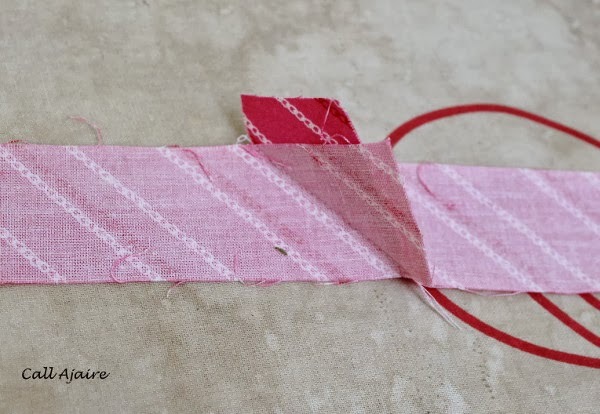 The gist is that you can cut any length of fabric strips on the bias and use glue to temporarily hold your seams so you can sit at the sewing machine and speed sew them all at once. Not just any glue, however. It needs to be Elmer’s school glue (*affiliate link). Elmer’s School Glue is basically starch so it doesn’t get sticky and gum up your needle and will completely wash away the first time you wash whatever it is you’re making. My favorite is the purple glue sticks, but you can definitely use the white stuff that comes in a bottle. Just make sure it’s school glue. Ok, here we go. 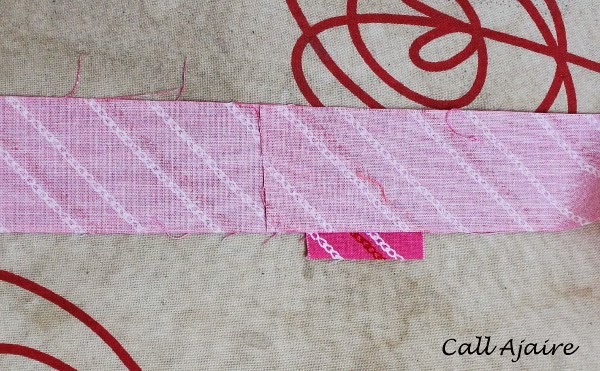 Start by cutting out strips of fabric on the bias. 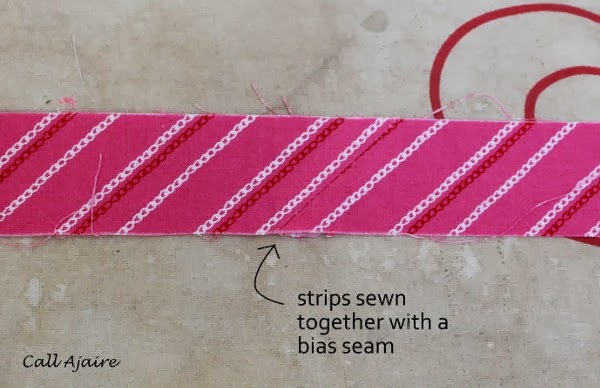 Just to get this out of the way: the strips in this tutorial are not true bias strips. I cut them on the straight grain, but for the purposes of this tutorial we can just pretend they’re on the bias. 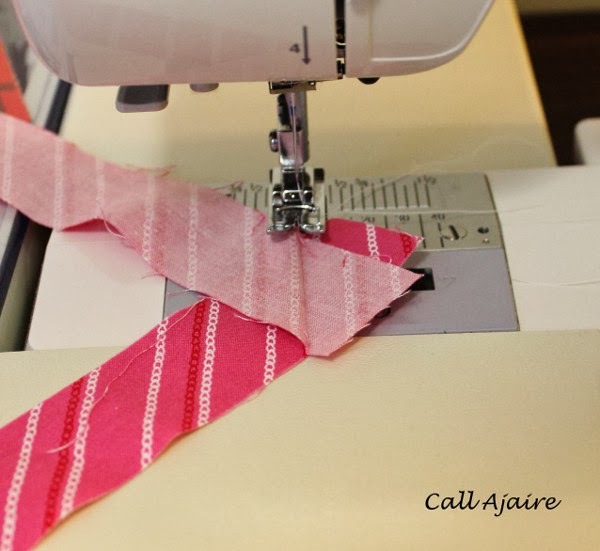 If you’re not sure how to find the bias of your fabric you can check out this pin. Cut any lengths that you’d like, but make sure you maintain the same width so the strips will line up correctly. If you’re not sure what width you want to cut you can check out this pin. 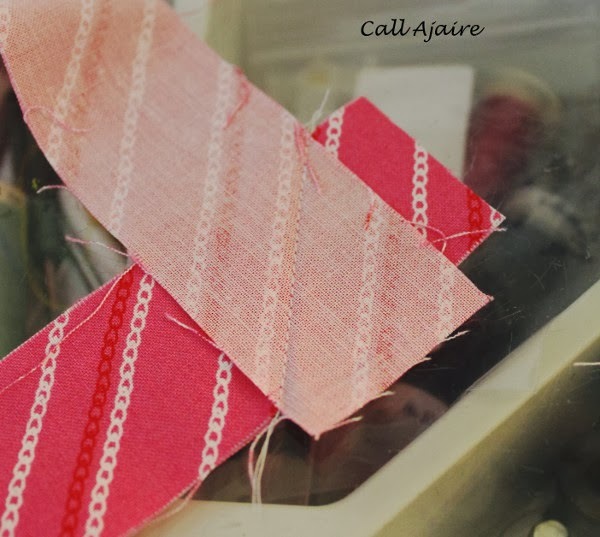 To make 1/2 inch double fold bias binding (1 inch single fold) I like to cut my strips at 2 inches wide. Step 1. Once you have all your strips move over to the ironing board and bring your glue. One strip at a time, with the wrong side up, press one end over creating a 45 degree angle. Leave the other end flat and proceed with doing the same to all of your strips. Step 2. Apply school glue to the 45 degree angle. You can see above where I put the glue since the stick glue is purple until it dries. If you’re using the white school glue you’ll want to try to get as little as possible on there so as not to make a gloopy mess. You really want the glue to dry just with the pressing of the iron. It’s totally doable, but I prefer the simplicity of the glue stick. Step 3. Take your next strip and place the square end of that strip (not the angled one) right side down on top of the spot where you placed your glue. You will want to be sure that the strip top and bottom edges match up nicely and that the top strip overlaps the bottom angled one just slightly. You can see in the picture above that the little strip that is hanging below the bottom edge is the bottom of the 45 degree angled strip from the gluing step. Step 4. Press with a hot iron for a few seconds to let the glue dry. It shouldn’t take more than 6 – 10 seconds. Moving on to the 45 degree angled edge of the second strip (the one on top), repeat Steps 2-4 for the remaining strips. When you are done you should have one long strip of glued sections. 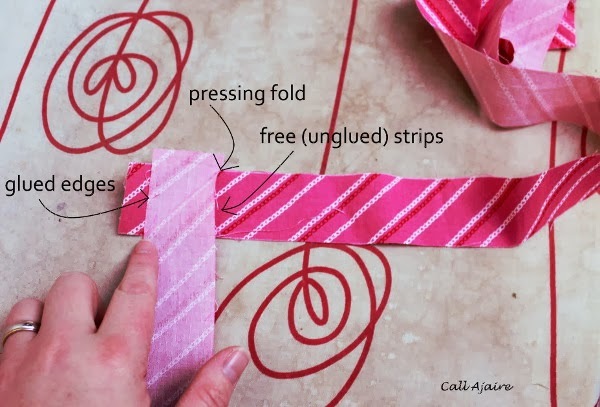 As you can see in the picture above if you unfold the 45 degree angle you will have a pressing fold line with the strips glued together above and to left of the fold and free to move around below and to the right of the fold. It is on this pressing fold that you will sew the bias strips together. Step 5. Move on to the sewing machine. 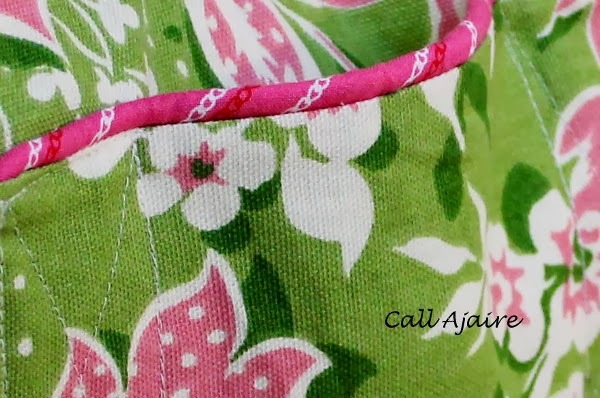 Remember since you are sewing on the bias that you will want to make your stitch length a little smaller. That will help to keep the seam from stretching too much in the wrong direction. You will stitch in the pressing fold of each of the glued strips. I like to speed stitch these by stitching down the fold and then pulling the next section around and putting it in line for stitching right after the completed one (just like speed piecing in quilting). 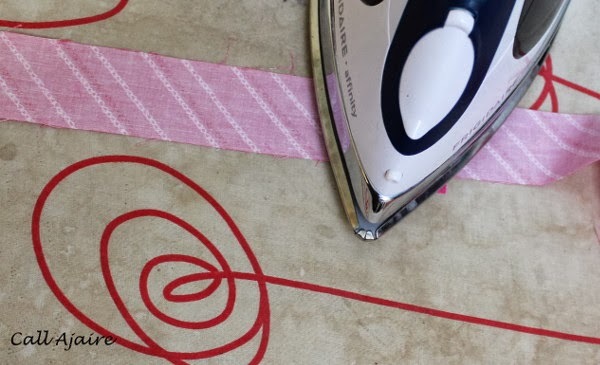 When you are done stitching all the seams, cut the threads connecting them and head back to the ironing board. Step 6. All of the stitched seams will look like the one in the picture above. You need to pull the two glued sections of the bias strip apart. Since it’s just school glue they should come right apart without having to pull very hard. Step 7. This is what the glue sections will look like once they’re released. Finger press them open. 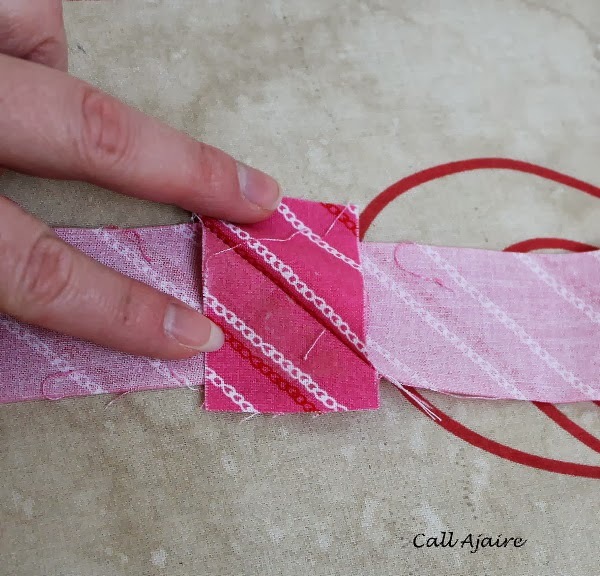 This step will help your bias tape lay nice and flat later so it’s worth taking the time to do. Release the glued sections of the entire strip. Step 8. Then trim all of your seams down to about 1/4 inch and trim off any overhang above or below the bias strip. Step 9. Flip the bias strip over and press one more time from the top. You can see in the picture above that the bias seam is less noticeable than a straight seam would be. It holds up to wear and tear much better as well because there is less stress on the seam. 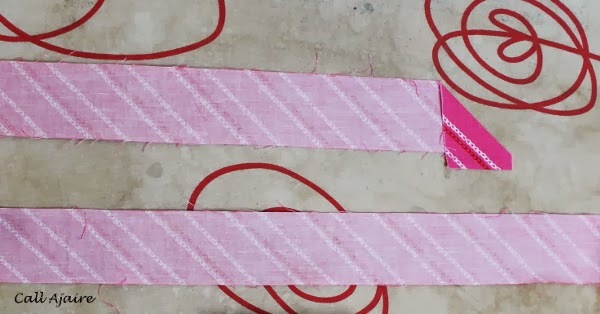 Now your bias strip is complete and ready to use as is or for single fold bias tape (above), double fold bias tape (below), or piping. Even if it seems like way too many steps to you, I encourage you to try this method. I have highlighted every step so that there would be no confusion, but it actually goes very quickly because you’re doing each step assembly line style. I’d love to hear what you think. I also use Elmer’s for temporarily holding down the binding on quilts so I can hand sew them without sticking myself with pins. What about you? Do you use glue for any sewing techniques? Somehow I think this peek at the Valentine's present is affiliated with the polka dots on instagram and I can't even imagine what you are making!!! I love the fabric for the piping!! Soooo……I'm scratching my head here. This is a game changer. I've never seen this, or the sew a tube method you mentioned. 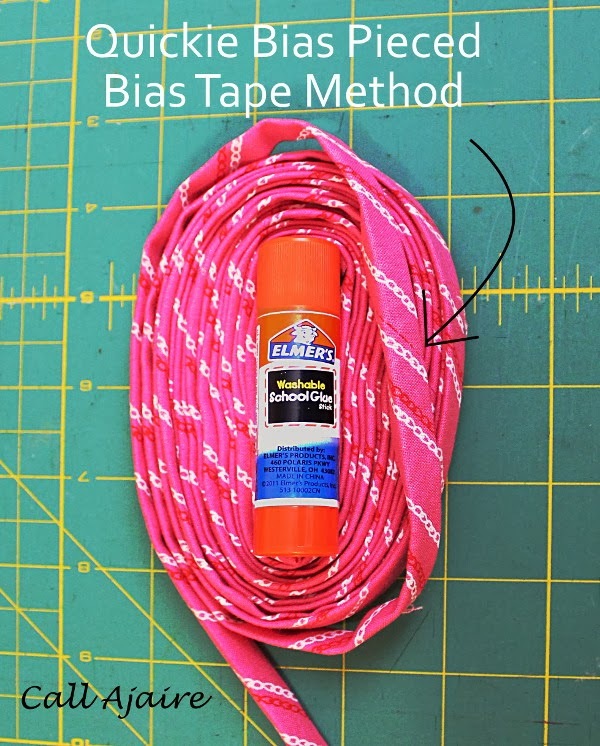 Absolutely fabulous post- I pinned it because I'm never making bias tape the dumb way again!! 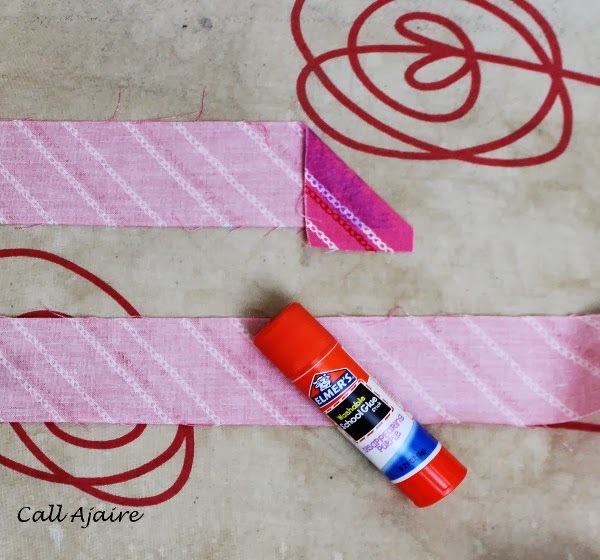 Elmer's school glue sticks are a staple in my sewing space. 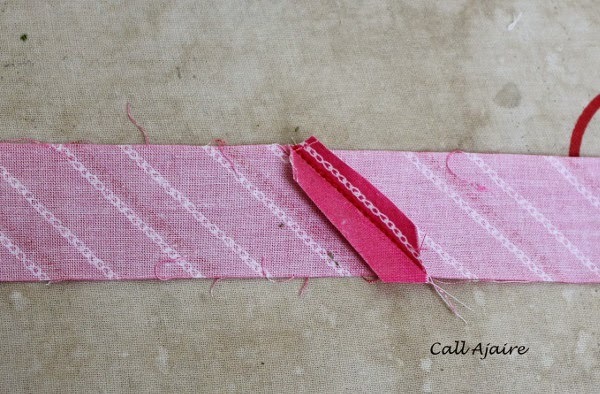 They are a great help when matching prints, stripes, plaids for piecing & other projects. So great! I have only made small batches of bias tape as I'm making it per garment, but I'd love to make some big batches of it. I even have the little metal bias tape makers to fold it all…it's all on that giant to do list. I was skeptical about using glue when I first heard it (for shaping pockets, I think), but now I can't wait to try it out. Thanks for this!! I totally agree the tapes at the store are boring, but this? This is AWESOME!